The Raad-1 AKA Thunder 122m SPG, is the first known Iranian SPG. It is built upon the Iranian Boraq APC hull, which is a modified BMP-2 which Iran has licence built. The turret is a copy of the Russian 2S1 122mm SPG. The ordnance is fitted with a double baffle muzzle brake and fume extractor. The main gun can elevate -3 to +72 degree’s. 35 x 122mm rounds can be stored. A 12.7mm MG can be fitted on the roof for Anti-Aircraft role. Maximum range is stated at 15.2km. Iran has operated a miss mash of US and licence built Russian vehicles for many years, including the US M109 SPG and T-72 MBT. The Raad-2 AKA Thunder 155mm, is a result of this miss mash. 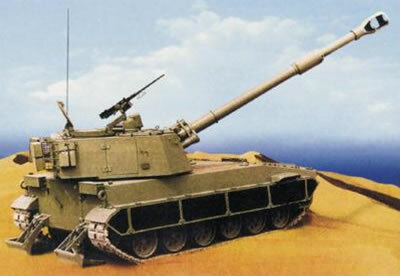 Its often compared in external appearance to the US M109 and reported to be assembled with automates components of the T-72. The 39 calibre Length main gun fires locally produced rounds to a range of 24km. The Raad-2M is reported to use a 700hp Ukrainian engine and distinguishable by a larger exhaust.